The compulsory licence was granted under Section 90 of the Indian Patents Act, on 12th March 2012 by India’s Controller of Patents (the highest authority of the Indian Patent Office) to the generic company Natco Pharma Ltd. for the eight years sorafenib tosylate will remain patented in India (until 2020), and against the payment of a royalty rate fixed at 6% (at the high end of the UNDP 2001 royalty guidelines). The CL was granted with 13 terms and conditions. Importantly, the price charged by Natco for the medicine is not permitted to exceed Rs. 8,880 (about US$176) for a pack of 120 tablets, required for one month of treatment. Natco must maintain records including accounts of sales in a proper manner and shall report the details of sales to the Controller of Patents as well as the Licensor (Bayer) on a quarterly basis. Natco has the right to manufacture the medicine covered by the patent at its own manufacturing facility but is not permitted to outsource the production. Payment of 6% royalties to Bayer is also a condition of the licence. What drug was the CL granted for? Sorafenib tosylate is an anti-cancer medicine for the treatment of primary kidney and advanced primary liver cancer known as hepatocellular carcinoma (HCC) that cannot be removed by surgery. Sorafenib can extend the life of kidney cancer patients by 4-5 years and in liver cancer patients by 6-8 months. Why is this important for MSF’s work? It is an encouragement to Indian generic companies who have increasingly felt that the legal risks and uncertainty prevents them from preparing generic versions of newer drugs. It can also encourage other developing countries to consider the use of CLs. Bayer obtained the marketing approval for Sorafenib in 2005 and launched its product worldwide in 2006 under the brand name Nexavar. It launched the drug in India in 2008. Bayer’s total sales of Sorafenib in 2009 were US$934 million. Bayer charges approximately US$66,812 per patient per year/ over US$5,500 per month in India for this drug. According to Natco, in India at least 100,000 people suffer from different types of renal cell carcinoma and hepatic cell carcinoma. Further, every year, 30,000 new patients are diagnosed with both these diseases and nearly 24,000 patients die. c) that the patented invention is not worked in the territory of India. All three grounds were upheld in the decision. (f) abuse of monopoly rights by charging exorbitant prices. Natco also stated that it can produce and market the medicine for US$173.93 per person per month, amounting to around US$2,086.83 per person per year. A discount of 97% on Bayer’s price. It also stated that Sorafenib would be made available free of cost to deserving and needy patients. Bayer opposed the CL application, citing both technical and substantial issues. Bayer justified the exorbitant price of Sorafenib by stating that "the innovation based products costs a price over generics but this price pays for the pipeline (i. e. future innovation) and competition...” However, Bayer refused to provide any details of its actual outlays on the research for sorafenib, a drug that was partly subsidized by the US Orphan Drug tax credit, and jointly developed with Onyx Pharmaceuticals. 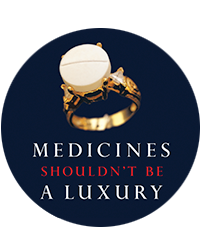 Bayer, being the innovator of the drug, also asserted that it has the right to determine what constitutes a "reasonably affordable price". Bayer justified its inability to ensure access to Sorafenib at an affordable price by stating that the estimated number of patients eligible for the treatment is fewer than that mentioned in the CL application and also that alternative treatments are available. According to Bayer, the total number of people who require Sorafenib treatment in India is approximately 8,000. Bayer also cited its patient assistance programme (PAP), a philanthropic programme to increase the availability of Sorafenib to patients. Even though the programme was launched in 2008, the coverage is very low. PAP covered 40, 44 and 42 patients in 2009, 2010 and 2011 October respectively. Sorafenib is not available on the NHS in England, Wales and Northern Ireland, as the National Institute of Clinical Excellence (NICE) has rejected the drug on the grounds that the cost of the medicine does not justify the benefit, (benefit: increasing survival in primary liver cancer by 6 months). Similarly, the Scottish Medicines Consortium, citing the same reason, refused the use within NHS Scotland. However, the incremental benefit of the medicine is considered as valuable. Indian generic company Cipla already sells sorafenib in India. They do so in breach of the patent- by simply ignoring it. Bayer sought to rely on the fact that Cipla was producing this drug in the case to argue that there was already a lower cost alternative available. The patent controller rejected this argument on the basis that Bayer is currently suing Cipla for patent infringement. The compulsory license decision has nothing to do with Cipla and if Bayer wins its case against Cipla, it would lead to the withdrawal of that product from the market. Part of this document is based the TWN articles ‘Stage set for compulsory license decision on anti-cancer drug’, published in SUNS #7326 dated 9 March 2012 and ‘India issues compulsory licence for anti-cancer medicine’ published on 15 March 2012 on the ‘Don’t Trade Away our Lives’ website.